Ladysmith/Vancouver Island based folk musician Ryan McMahon returns to Lethbridge in support of his brand new, sixth CD “In Line For A Smile. He plays a special house concert at the Flat, Tuesday, Jan. 22. “ It’s great. I’ve played there a couple of times. They’re super nice kids. They cram 40-50 people in to their basement,” he said, adding he enjoys playing house concerts. “I play about 70 of them a year. When you have gigs, Tuesday, Wednesday, Thursday and Friday, and you’re in the same area sitting in the hotel spending money and food, you might as well play. I’ve played in coffee shops, community halls, churches. I’ll play anywhere you want me too,” he said. 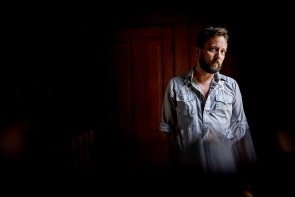 “ Craig Cardiff plays the Flat, that’s probably where I got their contact information,” he said. “I try not to wear my influences on my sleeve. But I love City and Colour and I’ll see your Jackson Browne and raise you a Warren Zevon, because I love his lyrics. And while I might not always like the Tragically Hip, I loved Gord Downie’s writing,” he said, adding it is hard to believe, that at age 39, he’s been playing music for 20 years and released six albums. “I came out of a bad place where I socialized, in quotes a little too much,” he said. “It’s easy to just stay in the hotel room and miss friends and family back home. So I’ve been making a point of getting out and meeting people. If I’m in Revelstoke, I’d go to a bookstore and just meet people,” he said. “I also lost a lot of people close to me like my grandpa. So ‘This House Is Not For Sale’ is about his house, where I spent a lot of time in and having to sell it. And the song ‘Mortality’ is about thinking of your mortality as well,” he said.